Chuck Shaw - Northeast Territory Manager for Navien America, Inc.
Mr. Chuck Shaw has more than 30 years in the plumbing and heating industry. He is a master plumber with more than 10 years of working in the condensing industry. He has been a trainer and currently works as Northeast Territory Manager of sales for Navien America, Inc. Plumbing 101 Sessions are Back! Associate members that attend the 101 session can attend the technical meeting that follows free of charge. An introduction to Water Heaters: The session is geared toward designers and engineers who have limited knowledge of water heating concepts and equipment type, for commercial domestic water heaters. The presentation will include the basic water heater types, instantaneous, Semi-instantaneous, and storage. Energy considerations for different type heaters and projects. Basic energy consumption differences between the water heater types, and some pros and cons for each type. Questions are welcomed and attendee participation is the goal, along with improved understanding of the water heater selection process. 101 sessions are held during the social hour, 5:00pm - 5:45pm. 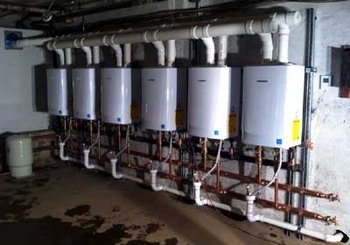 History of tankless water heaters, where and why they were designed. The presentation will be focusing on the, advantages, challenges, application and expectations of tankless water heating. Design considerations sizing the heaters, if storage is required on not piping guidelines gas supply considerations, venting requirements will also be discussed during the presentation. Registrations received by Monday, January 12th are $20 and $30 after.